The Palestinian Prisoners’ Society (PPS) has reported that Israeli soldiers abducted, overnight and at dawn Wednesday, at least fourteen Palestinians, during various invasions targeting homes in several communities in the occupied West Bank. The Hebron office of the PPS said the soldiers invaded several communities in the district, searched and ransacked homes and abducted four Palestinians identified as Mohammad Khaled Abu Sil, 26, Mohammad Nour Gheith, Ehab Ismael Sharawna, and Ahmad Haitham Abu Atwan, 18. In Bethlehem, the soldiers searched homes and abducted Mahdi Taha Sheikh, 19, Yazan Mohammad Sheikh, 15, and Anis Mashhour Hamamra, 37. In Ramallah, the soldiers abducted Othman Farid Zeebari, after invading his home and searching it. In Jenin, in the northern part of the West Bank, the soldiers invaded and searched homes and abducted Mojahed Adel Yassin. One Palestinian, identified as Mohammad Alawna, was abducted from his home in Tubas, in central West Bank. 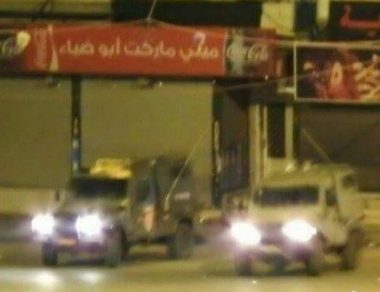 In the northern West Bank district of Tulkarem, the soldiers abducted two Palestinians, identified as Majdi Ahmad Obeid, 42, and Moath Yasser Awad, 27, after invading their homes and searching them. In Nablus, in the northern part of the West Bank, the soldiers abducted two Palestinians, identified as Moath Tal’at Saleh, 24, and Ismael Amjad Takrouri, 20, who was also shot and injured by army fire prior to his abduction. In related news, the soldiers shot and injured at least six Palestinians, after the army invaded Qalandia refugee camp, north of occupied Jerusalem, and prevented journalist and medics from entering it. The soldiers also demolished structures and causing fires in a truck and several cars.